A clattering in the sky materializes into a blue, white and red helicopter, which settles down in the middle of the highway and shuts down its engines. A stretcher is rolled away from it, then rolled back a few minutes later and disappears inside. The pilot spools up the turbines, takes the helicopter up a few feet, slowly rotates it 180 degrees and flies away. This is the scene on many highways in Nova Scotia at motor vehicle collisions. 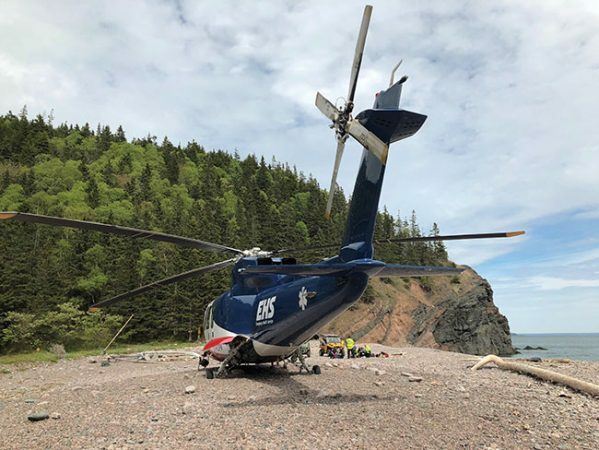 Fire trucks, ambulances and police cars will block off a healthy chunk of road to create a landing zone for the helicopter, a Sikorsky S-76C+, to transport surviving passengers to Halifax hospitals. This helicopter and its mate, called LifeFlight Tango and LifeFlight November, are owned and operated by Canadian Helicopters Limited (CHL) for EHS LifeFlight, which operates under the management of Emergency Medical Care Inc. (EMC). A private company, EMC since 1998 operates under contract to the Nova Scotia government’s Department of Health and Wellness, Emergency Health Service division. Built in 2005, the 76C+ has twin Saffron Arriel 2S1 engines, capable of a take-off power of 856 shaft horsepower. Its speed, range and IFR capability are desirable for EHS LifeFlight missions. 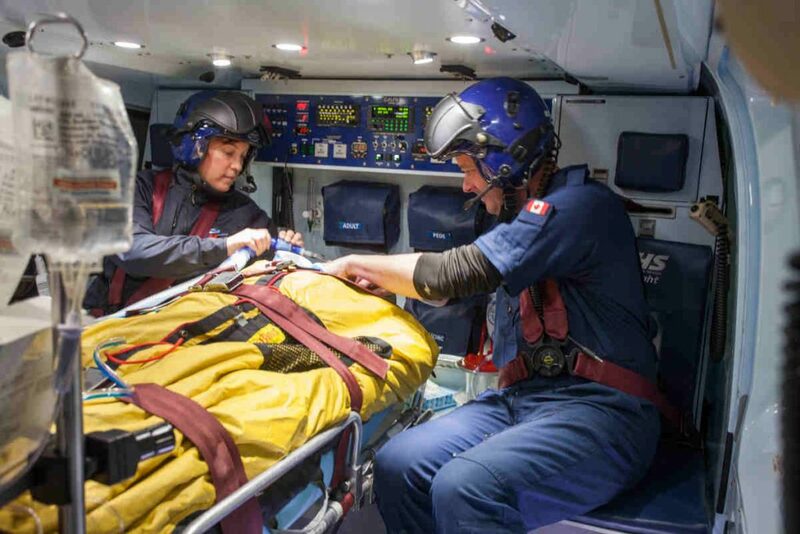 Critically ill patients must be moved quickly and with EHS LifeFlight serving Nova Scotia, Prince Edward Island and New Brunswick, and being on the East Coast, the pilots – on 24/7 alert – had best assume that they will encounter instrument meteorological conditions. The power and flyaway capability the engines provide allowed EHS LifeFlight to resume helipad landings after Transport Canada forbid them for the A model in 2016 – a drag on a service mandated to move critically ill patients to specialized care facilities as rapidly as possible. “The A model was capable of doing the maneuvers, but it wasn’t written in the manual. In 2016, we were informed by Transport Canada that the A model would no longer be allowed to do these maneuvers,” Flynn says. Tango and November are two of the most modern S-76C+ aircraft in operation, according to EHS LifeFlight. Flynn refers to the “great patient care compartment,” “radio and communications systems in the back for the medical staff to talk to their people,” and “a lot of cockpit upgrades,” in the 76C+, including night vision goggle-compatibility and real-time weather feed from NAV Canada, dual Garmin 750s, bluetooth interface, and XM satellite. The EHS LifeFlight hangar is located at the Halifax Stanfield International Airport. It houses the two helicopters, the Super King Air and a freightliner ground unit, as well as adult clinical teams and program administration. Engineering support is also handled at the hangar by dedicated engineers for each company. PAL Airlines operates the Super King Air and PAL employees are dedicated to the EHS LifeFlight program under contract. Two pilots and two medical specialists are on each shift. Everyone and everything is kept in a in a state of readiness that allows wheels up in as little as 10 minutes. “One aircraft is always mission ready, while the other undergoes routine maintenance. The expectation is 10 minutes wheels up during visual flight rules conditions and 20 minutes wheels up during IFR conditions. Once we get a request for a transport, the pilots will check the weather right away. If it is suitable for helicopter flight, they will pull the helicopter out of the hangar and get it ready. Once the mission is launched, they have 10 minutes to wheels up,” Flynn explains. The basic pilot qualifications include solid instrument flight rules experience and previous medivac and maritime flying experience. They are also trained to assist with triage in the case of mass casualty incident situations. The medical teams, the composition of which changes according to the mission, are made up of critical care paramedics, critical care nurses and registered respiratory therapists, depending on the patient being moved. While most NS hospitals have helipads, there are just two at hospitals in PEI and one in NB. There are ground-based helipads on hospital property or community-sponsored helipads. “We have quite a network of community helipads around the province. Most are looked after by community organizations. We send our pilots out on an annual basis to inspect them. There are portable lights to put down around the landing zone and local fire departments go out to inspect the ground for foreign object debris and to set up the lights,” Flynn says. For missions to locations away from the luxury of landing pads, EHS LifeFlight has a network of more than 10,000 Landing Zone Officers it has trained, mostly volunteer firefighters. “They look for level ground free of obstructions. They control the area until the helicopter lands, and the engines shut down, and they monitor the takeoff too,” Flynn says. Between the two Sikorskys and a Super King Air 200, EHS LifeFlight completes more than 900 missions per year, and the number is rising. “We’ve set a record every one of the past five years,” Flynn says. The Sikorskys – think first responder – go where the King Air cannot. The King Air is more of an interfacility transporter. “Interfacility transports are the hospital-to-hospital transfers for escalation in care,” Flynn says. “Once a patient gets too sick or requires a specialty service, we step in for the care and transport.